I have never been a fan of chicken pot pie, something about the soupiness of it and the pie crust just didn’t equal delicious to me. But both my dad and hubby love pot pie. After a recent trip out to eat where Campy had a KW version of pot pie that was actually pretty scrumptious I was inspired to overcome my aversion. Well whose recipes usually convert me over to a believer? That would be my lovah, Alton Brown. Hold up, Alton Brown you say? Ok so he may not been oozing with dancing with the stars sexiness but his recipes are technical and my perfect go to for any accurate version of your favorite dish. I found his chicken pot pie and of course he one upped it by not making a pie crust, but using biscuits! 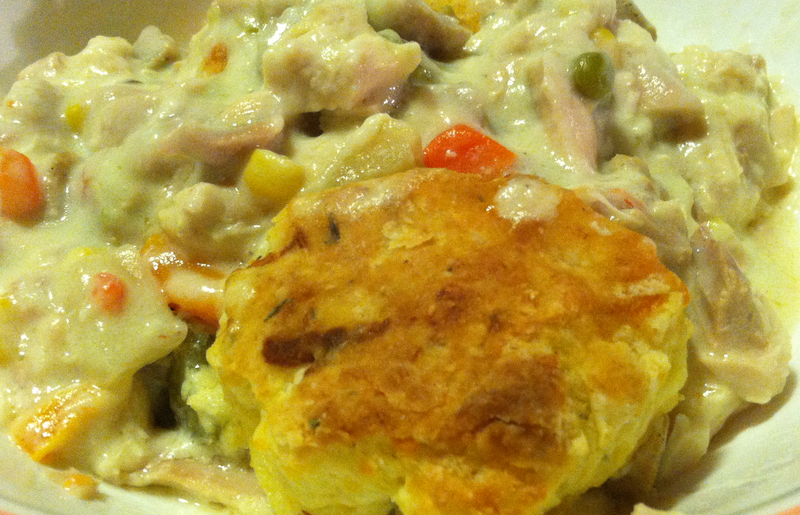 Think what it would be like if chicken and dumplings and chicken pot pie had a baby. For the filling: Set a 10-inch cast-iron skillet over medium heat. Crumble the chicken sausage in the pan and cook, stirring occasionally, until no longer pink, about 6 minutes. Add the butter and melt, stirring to coat the sausage. Sprinkle the flour onto the sausage and cook for 2 minutes, stirring frequently. Pour in the milk and chicken broth and scrape any browned bits off the bottom of the pan. Bring to a simmer and cook until sauce thickens, about 2 minutes. Add the shredded chicken, salt, sage, and pepper. Stir to combine and set aside while preparing the biscuits. For the biscuits: Combine the flour, baking powder, baking soda, salt, thyme, sage, and cayenne pepper in a medium mixing bowl and set aside. Grate the cheese and butter using the large shredding disk of a food processor or the large side of a box grater. Immediately add the cheese and butter to the flour mixture. Stir to combine. Pour in the buttermilk and stir just to combine. Dump the dough onto a floured work surface and start folding the dough over on itself, gently kneading for 30 seconds, or until the dough is soft and smooth. Press the dough into a 1/2-inch thick round. Use a 3-inch round cutter to cut out the biscuits, being sure to push the cutter straight down through the dough to the work surface. Make your cuts as close together as possible to limit waste. Gather together any remaining dough, pat out again, and cut out as many biscuits as you can in order to get 9 total. To build the pie: Set the biscuits on top of the filling, placing 8 around the edge of the pan and 1 in the middle. Bake until the biscuits are tall and golden brown, 15 to 20 minutes. Cool on a cooling rack for 10 minutes before serving.